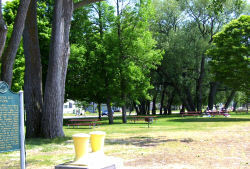 This large city park offers a variety of activities in Ludington within walking distance of downtown, and the carferry docks. It is probably best known for its white sand beach and the walk to the lighthouse, but there are ample picnic grounds, a playground, volleyball, shuffleboard, and mini-golf. Be prepared for a windy Lake Michigan beach experience on many days! Stearns Drive is one way; enter from the north end. Fishing- You can fish Lake Michigan off the breakwall. At the south end of the park the sidewalk connects to the breakwall, or you can cross the beach at any point to reach the cement breakwall. The walk is about 0.5 mile each way, longer than it looks. This is a wonderful walk on a calm day, but can be treacherous in windy, wet, or icy weather. Don't miss this opportunity, but don't make stupid decisions on bad days either! Distance and time- 0.5 mile each way, allow about 20-30 minutes for sightseeing. There is a large playground at the south end of the park with swings, toddler swings, several slides including spiral, several climbers (half dome, dinosaur, more), play fire engine, see-saw, merry-go-round, spring merry-go-round, surface is beach sand. Near south end of park: Shuffleboard courts ($2/hour per person, children under 10 must be acccompanied by adult), Mini-golf (open noon-9pm, cost uncertain- season opens June 15). New skateboard park will be between the shuffleboard and mini-golf. 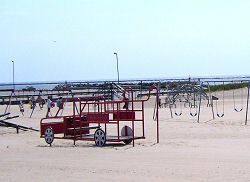 Four volleyball nets on beach. Interpretive Signs- There is a sign near the middle of the park near the road with information about the Lake Michigan Beach, Epworth Assembly, and the City of Flint which ran aground in the 1940 storm. Liberty Tree Memorial Elm - north end of park - "This American Liberty Elm was named after 'The Liberty Tree - our country's first symbol of freedom.' On the morning of August 14, 1765, the people of Boston awakened to discover two effigies suspended from an elm tree in protest of the hated Stamp Act. From that day forward, that elm became known as 'The Liberty Tree.' It stood in silent witness to countless meetings, speeches and celebrations, and became the rallying place for the Sons of Liberty. In August of 1775, as a last act of violence prior to their evacuation of Boston, British soldiers cut it down because it bore the name 'Liberty.' Elm Research Institure, Keene, New Hampshire." Veteran's Memorial Flagpole - middle of the park - "Valor; For God and Country; Dedicated in grateful tribute to the living and dead who through their valiant efforts and bitter sacrifice have made and kept America great; WWI, Spanish American War, Vietnam, Korean Conflict, WWII; dedicated 1958"
Armistice Day Storm Michigan Historic Site - 2/3 of way south through park - "On November 11, 1940, a severe storm swept the Great Lakes area. As it crossed Lake Michigan ships and seamen fought to reach safety away from its blinding winds and towering seas. Between Big and Little Points Sable the freighters William B. Davock and Anna C. Minch foundered with the loss of all hands. The crew of the Novadoc, driven aground south of Pentwater, battled icy winds and water for two days before being rescued by local fishermen. At Ludington the car-ferry City fo Flint 32 was driven ashore, her holds flooded to prevent further damage. Elsewhere lives were lost and ships damaged in one of Lake Michigan's Greatest Storms." SS Pere Marquette 18 Michigan Historic Site - south end of park - "At least twenty-nine persons died when this vessel sank in Lake Michigan twenty miles off the Wisconsin coast on September 9, 1910. One of the Ludington carferry fleet, the 350 foot S.S. Pere Marquette 18 was traveling from this port to Wisconsin. About midlake a crewman discovered the ship was taking on vast amounts of water. The captain set a direct course for Wisconsin and sent a distress signal by wireless. He and the crew battled for four hours to save the boat but she sank suddenly. All of the officers and many of the crew and passengers perished, among them the first wireless operator to die in active service in the Great Lakes. The S.S. Pere Marquette 17, aided by other ships who heeded the wireless message for help, rescued more than thirty survivors but lost two of her own crew. The exact cause of this disaster remains a mystery." Ludington Lighthouse - at the end of the breakwall - The North Breakwater Lighthouse was transferred to the City of Ludington on June 2, 2007. The Lighthouse will be operated by the Sable Points Lighthouse Keepers Association and will be open for tours beginning June 9th. Hours of operation for the lighthouse will be 2pm-7pm Thursday- Sunday, June- August. 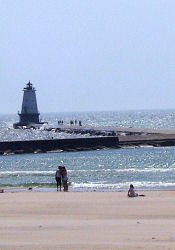 Lake Michigan swimming from South Pier Beach is located on the south side of the Ludington Pier, and north of the Loomis Street boat launch. Near the south end of the Park is a sidewalk that connects to the main walkway through the park. This leads to a circular cement deck overlooking the lake which has space for wheelchairs and also has benches. The sidewalk also ramps down to the level of the breakwall for access to that cement surface. Note that there may be sand which has blown over the cement in spots. Access- paved Stearns Drive off N. Lakeshore Drive, one way north to south. Also parking at the west end of Ludington Ave.
Ecosystem- Lake Michigan beach with grassy park between beach and city street. Small city urban area. Boating channel and charter fishing facilities to the south. Take US 10 west into Ludington. This becomes Ludington Avenue. Continue west until the last street before the lake, which is Lakeshore Drive. Turn north, and go 0.5 mile to the entrance of the park, on your left. Stearns Drive is one way, you cannot enter from the south, although there is limited parking at the end of Ludington Avenue.